* Testing performed under controlled conditions, actual results may vary depending on conditions, type of hydraulic fluid and maintenance practices. 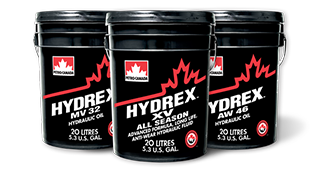 Fuel efficiency results are based on both field and laboratory pump efficiency testing performed using HYDREX XV measured against leading North American monograde hydraulic fluids. Extended drain intervals are based on superior performance demonstrated in industry recognized ASTM D943 oxidation stability tests against leading North American hydraulic fluids. ™Owned or used under license. ©2018 Petro‐Canada Lubricants Inc., all rights reserved.